KIEV, Ukraine -- Rinat Akhmetov, Ukraine’s richest man, added $3 billion to his net worth in the past six months by buying state-owned energy assets sold by his hometown political ally, President Viktor Yanukovych. As the sole bidder in two of five government auctions held since November, Akhmetov’s DTEK Holdings BV paid about $600 million to acquire state stakes in some of the country’s leading power generators and distributors that gave him control of about 70 percent of the country’s thermal power output. Consolidating the assets almost doubled DTEK’s equity value to more than $8 billion, boosting Akhmetov’s personal fortune to more than $18 billion, according to the Bloomberg Billionaires Index, a daily ranking of the world’s richest people. “Before these privatization auctions, DTEK was already a minority shareholder in these utilities and controlled their management,” said Serhiy Diachenko, who covers energy at Kiev, Ukraine-based think tank Razumkov Center for Economic and Political Studies. Ruslan Leonenko, a DTEK press officer, declined to comment for the story or on whether the privatization terms and the prices paid for the assets were fair. Unlike Russia, Ukraine doesn’t have oil reserves and depends instead on steel exports for revenue, as well as electricity sales to countries including Hungary and Poland. Akhmetov, 45, a dominant presence in the country’s steel and coal business since the late 1990s, has added control of Ukraine’s power generation industry in recent months. Akhmetov is one of Ukraine’s most controversial figures who, like Yanukovych, hails from the industrial Donetsk region, a mainly Russian-speaking area in the eastern part of the country. He also represents the president’s Party of Regions in the Verkhovna Rada parliament. The son of a coal miner and a shop assistant, Akhmetov established himself in the Ukrainian business community in the early 1990s when he started trading metals and coal. He seized on the financial chaos that followed the breakup of the Soviet Union to buy Ukraine’s stakes in some of the country’s biggest steel mills and coal mines. They were later combined into steelmaker Metinvest Holding LLC and DTEK Holding, a producer of electricity for power stations. Akhmetov started in business working for Akhat Bragin, who was once accused by a local police chief in Donetsk of having connections to organized crime. Bragin, who denied the claim, was killed along with five associates in an explosion at the Shakhtar Donetsk soccer club’s stadium during a match in October 1995, while serving as president of the club. Akhmetov, who was a vice president of the club, replaced Bragin, and continues to serve as president today. Akhmetov’s attorneys from Akin Gump Strauss Hauer & Feld LLP said in a statement published on March 2, 2006, that Akhmetov had fully cooperated with all police investigations, had never been charged with any crime and had never been implicated in any manner in the Bragin murder by the police or prosecutors. 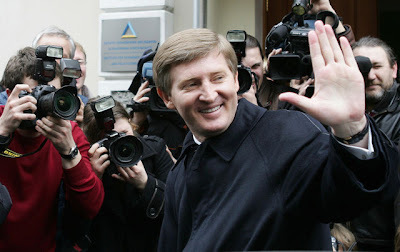 Akhmetov’s attorneys denied any criminal involvement and, in 2008, sued Ukraine’s online publisher, Obozrevatel, in London for publishing a series that associated Akhmetov with past connections to organized crime, winning a £50,000 libel settlement against them for damage to his reputation. This included the creation in 2000 of a holding company called System Capital Management JSC, which now controls more than 100 companies ranging from metals and mining to pharmaceuticals and real estate. According to SCM’s website, the company employs 260,000 people and had revenue of $12.8 billion in 2010 and “group assets” of $22.8 billion. In addition to reporting corporate financial information, Akhmetov also employs a stable of professional managers to run his businesses, including former consultants from McKinsey & Co. Inc. and PriceWaterhouseCoopers LLP, and, at Metinvest and DTEK, top-managers who were hired from Russian metals and mining companies including OAO Severstal (SVST), United Co. Rusal and OAO Mechel. Throughout his career, Akhmetov has maintained a close connection to Yanukovych. The politician became governor of Akhmetov’s native Donetsk region in 1997 and was subsequently appointed Prime Minister. In 2004, Akhmetov supported Yanukovych’s first run for President, donating an undisclosed sum to his election campaign. Akhmetov’s Shakhtar Arena was selected to be one of the stadiums that will host the European Soccer Cup in June. At the same time, Yanukovych’s political failures have been painful for Akhmetov. When Yanukovych lost the presidential race to Viktor Yushchenko, the new president annulled the state asset sales of 2004, which saw Akhmetov and his partners paying $800 million for Kryvorizhstal, Ukraine’s largest single steel mill. Yushchenko unwound the deal and, in 2005, re-sold the mill to billionaire Lakshmi Mittal’s steelmaker for $4.8 billion. In 2010, Yanukovych was elected President and not long after Akhmetov’s business began to expand once again, including the purchase from private owners of two competing steel mills, MMK Ilyich and Zaporizhstal, which boosted the company’s 2011 revenue by 52 percent to more than $14 billion. Akhmetov’s 100 percent ownership of DTEK and his 71 percent stake in Metinvest today make up more than $16 billion of his total net worth. DTEK is valued by taking the average of enterprise value- to-Ebitda (earnings before interest, taxes, depreciation and amortization) and price-to-earnings multiples of five publicly- traded energy peers, including Dniproenergo (DNEN), Coal Energy SA (CLE), Tauron Polska Energia SA (TPE), CEZ AS (CEZ) and OJSC Irkutskenergo. The figures used for DTEK are forecasts for 2012 provided by Concorde Capital, a Ukraine-based investment bank that follows the company, while those used for its peers are the latest available results. Metinvest is valued using the average enterprise value-to- Ebitda multiple of ArcelorMittal (MT), Evraz Plc (EVR), Eregli Demir VE Celik Fabrik, OAO Novolipetsk Steel (NLMK) and OAO Severstal. Akhmetov’s other investments total more than $2 billion. His 100 percent ownership of First Ukrainian International Bank was valued by taking the average price-to-book value multiple of publicly traded peers, including JSCB Ukrsotsbank and PAT Raiffeisen Bank Aval. His 100 percent stake in Mining Machines Company was valued by using the price-to-earnings and enterprise value-to-sales multiples of peers that include Famur SA (FMF), Outotec Oyj (OTE1V) and ERA Mining Machinery Ltd.
Akhemtov’s Ukrainian commercial real estate investments are valued at more than $100 million, while his agricultural holdings are worth more than $750 million. The tycoon made an early move toward succession when he tapped his oldest son, Damir, to sit on DTEK’s board of directors in December and to join Metinevst’s board of directors in April. The 23-year-old studied in Le Rosey school in Switzerland and City University of London, and in 2010 earned a masters’ degree in finance from Sir John Cass Business School in London.